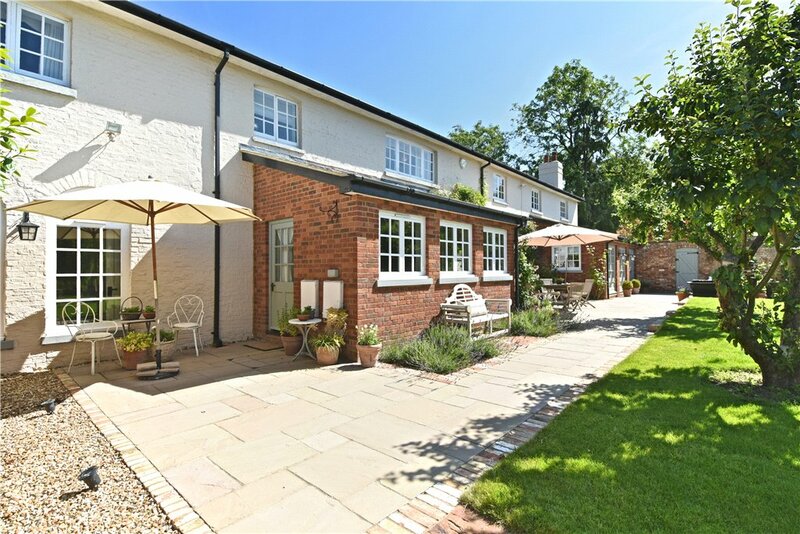 A Grade II listed brick under slate five bedroom property located within gated Shenley Park. 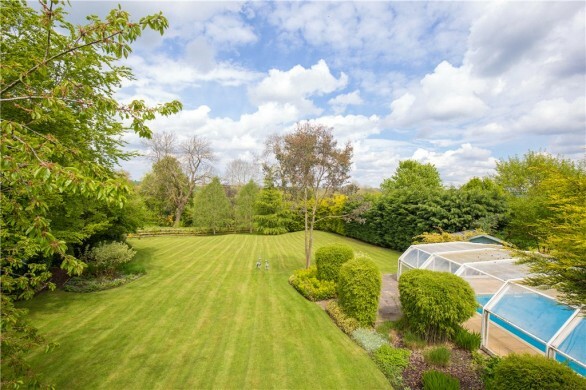 The property is part of the original Shenley Park House and has accommodation of approximately 3,021 sq. ft. set over two floors and approached via a tree lined gravel driveway. There are three reception rooms, a kitchen/breakfast room, a utility room and cloakroom on the ground floor. On the first floor there are five double bedrooms, an en suite bathroom, an en suite shower room and a main bathroom. The garden has been recently landscaped and there is a double garage. A part glazed door leads into the entrance lobby which has solid oak flooring. This extends into the main entrance hall which has windows to the front, downlighting and a dog leg staircase to the first floor. The cloakroom has solid oak flooring and is fitted with a Heritage suite of a WC and a pedestal wash basin. The triple aspect drawing room has three pairs of French doors to a terrace in the garden and windows to either side. The stone fireplace has an open grate and a marble hearth, and there is downlighting and solid oak flooring. 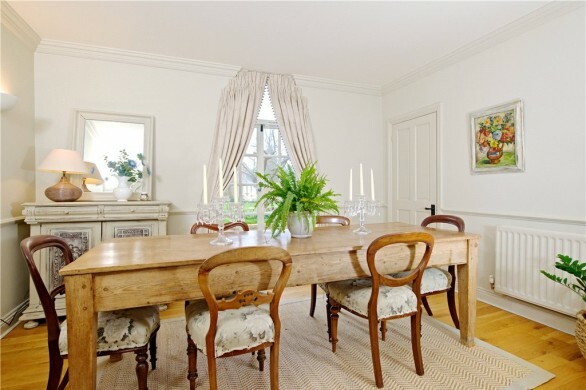 The dining room has a feature arched window with a window seat, a door to the understairs storage cupboard, and solid oak flooring. 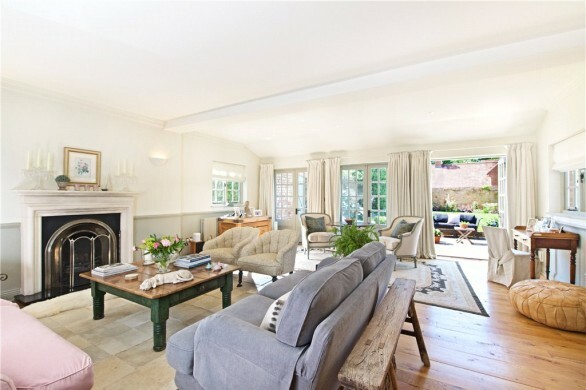 The family room has an open brick fireplace with a stone hearth fitted with a wood burning stove. 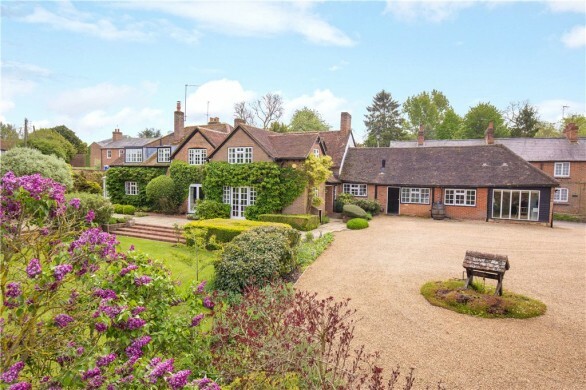 There are two arched windows overlooking the garden with a further window to the front. 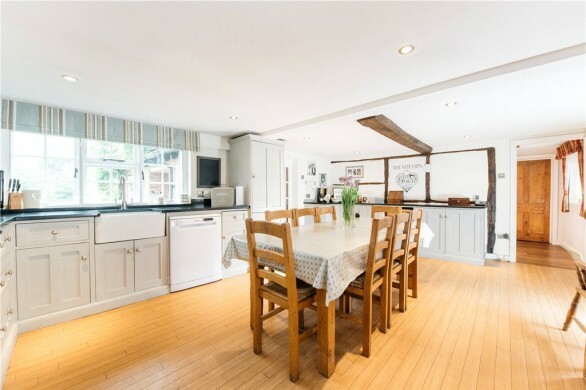 The kitchen/breakfast room is fitted with a range of hand crafted floor and wall units with granite work surfaces and a butler&#146;s sink with a mono tap over. There are built-in twin ovens, a space for an American style fridge/freezer and an integrated dishwasher. 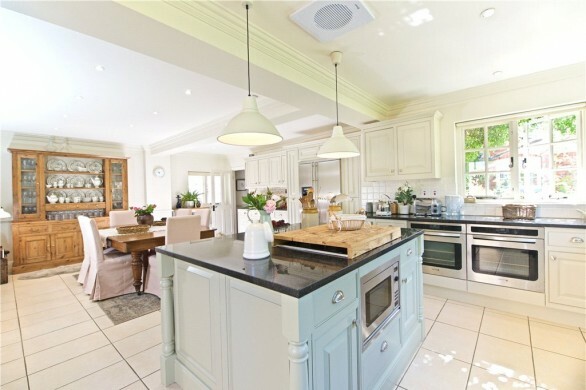 A central island provides a breakfast bar and has an integrated microwave and a five ring gas hob. There is tiling to the splashback areas and a tiled floor. 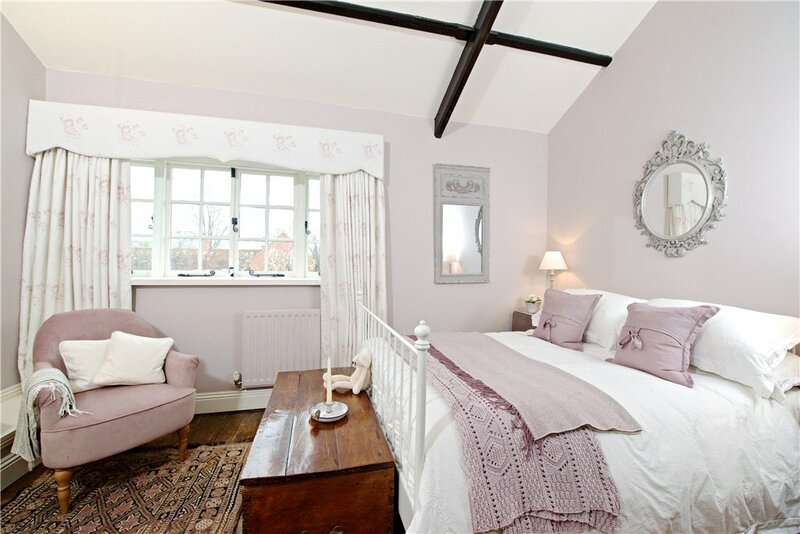 The room is triple aspect with windows to the rear overlooking the landscaped walled garden, and another window and a part glazed door to the sides. The utility room is fitted with a range of floor and wall units with a stainless steel sink and drainer and spaces under the work surface for a washing machine and a tumble dryer. There is a door and a window to the communal courtyard. 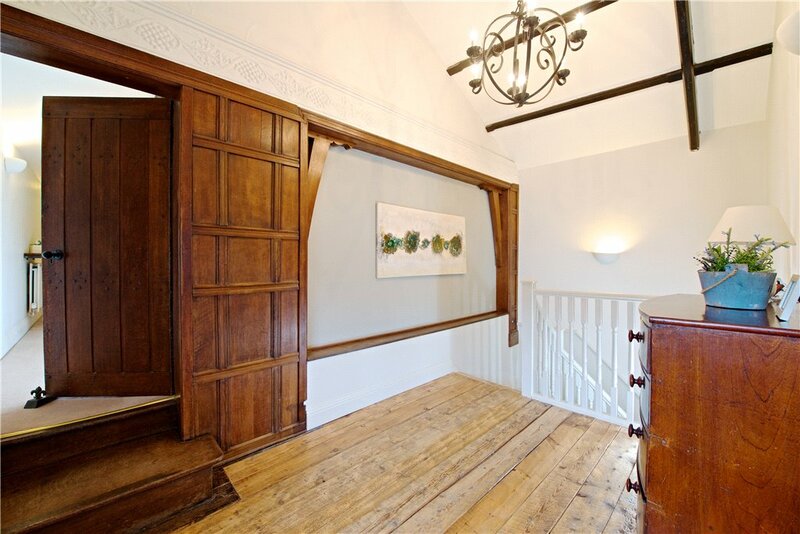 The landing has a part vaulted ceiling with exposed beams, and original oak panelling with a panel of pargeting over. There are two windows, original exposed floorboards and an airing cupboard. 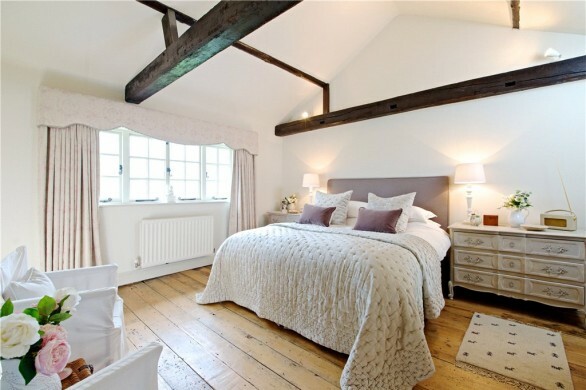 Bedroom one has a vaulted ceiling with exposed timbers, stripped floorboards, a window overlooking the garden and recessed shelving. The en suite is fitted with a Heritage suite of a WC, an antique style wash basin with porcelain legs, and a claw foot slipper bath with mixer taps and a shower attachment over. There is a window overlooking the garden and a tall shelved cupboard. Bedroom two has a vaulted ceiling with exposed beams, a double wardrobe and a window overlooking the garden. 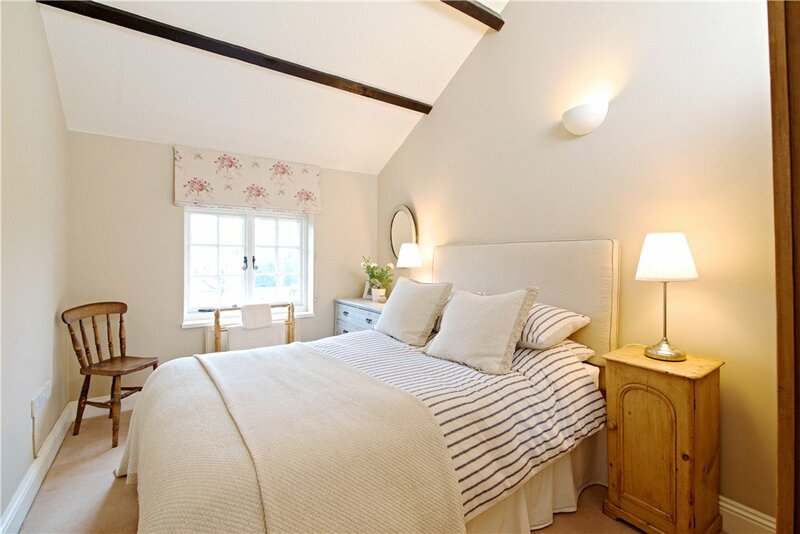 The en suite has a window to the side and is fitted with a WC, a rectangular wash basin mounted on an antique pine stand, and a fully tiled double shower with a sliding glass door. 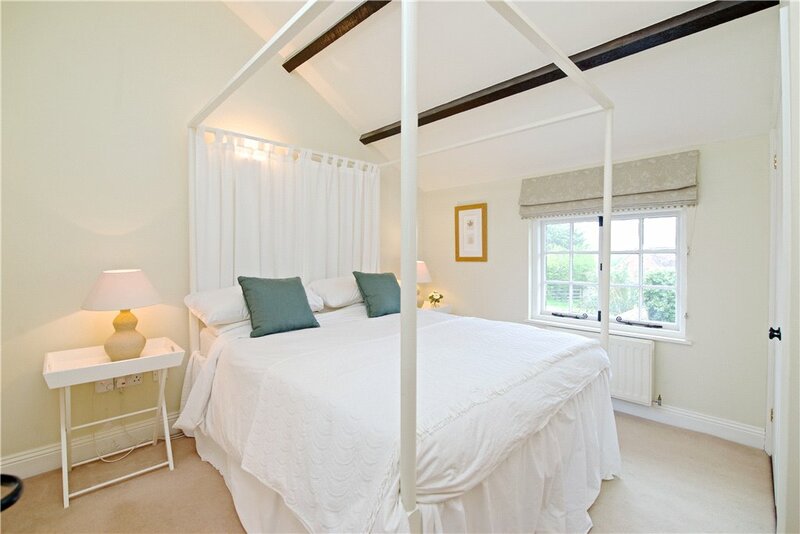 Bedrooms three and four both have vaulted ceilings with exposed beams, roof timbers, built-in wardrobes, and windows overlooking the garden. Bedroom five also has a window overlooking the garden. 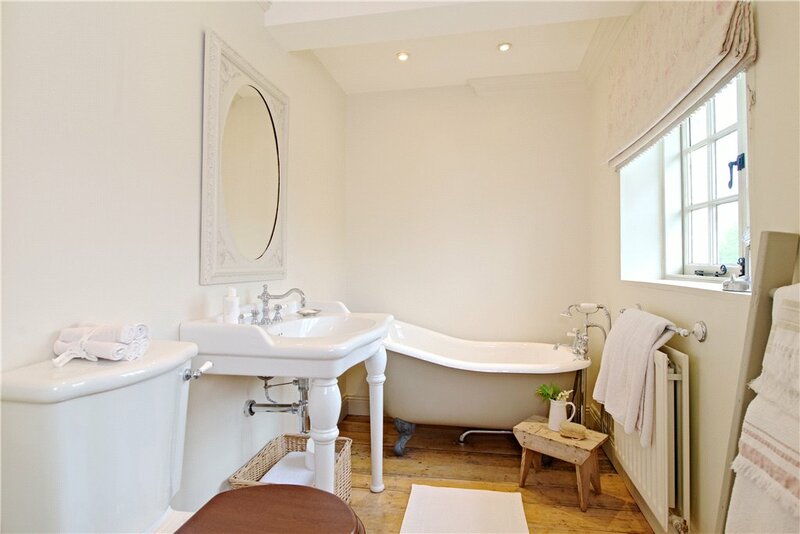 The bathroom is fitted with a Heritage suite of a WC, a pedestal wash basin, and a panelled bath with mixer taps and a shower attachment over. The walls are tiled to half height and the floor is tiled. 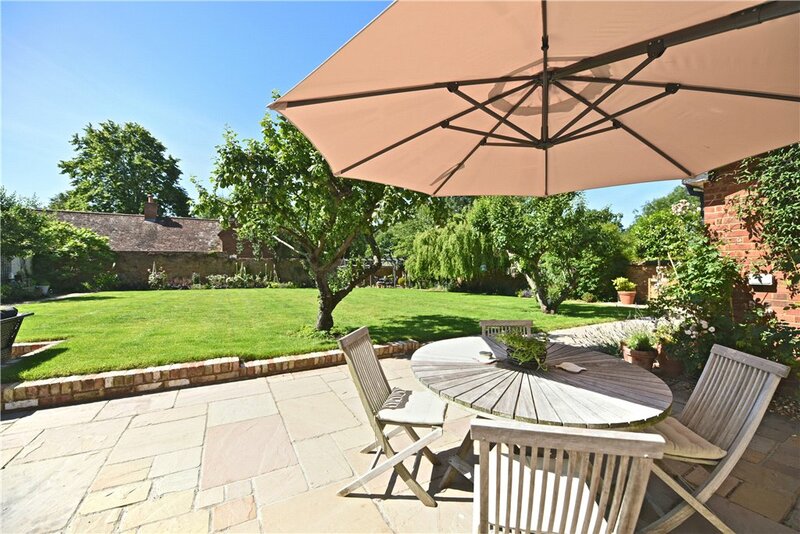 The landscaped garden has a York stone patio across the rear of the house with low brick walling, a lawn with planted borders and several mature trees. 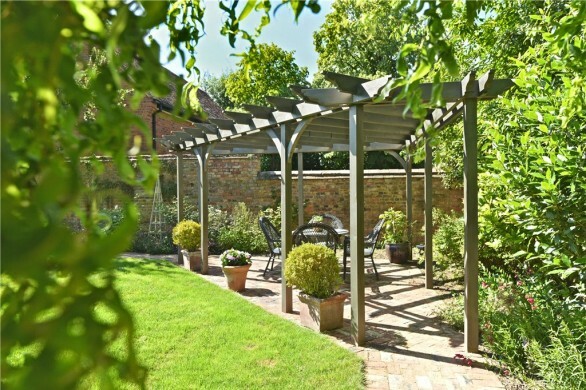 There is a pergola area in one corner with a brick patio. 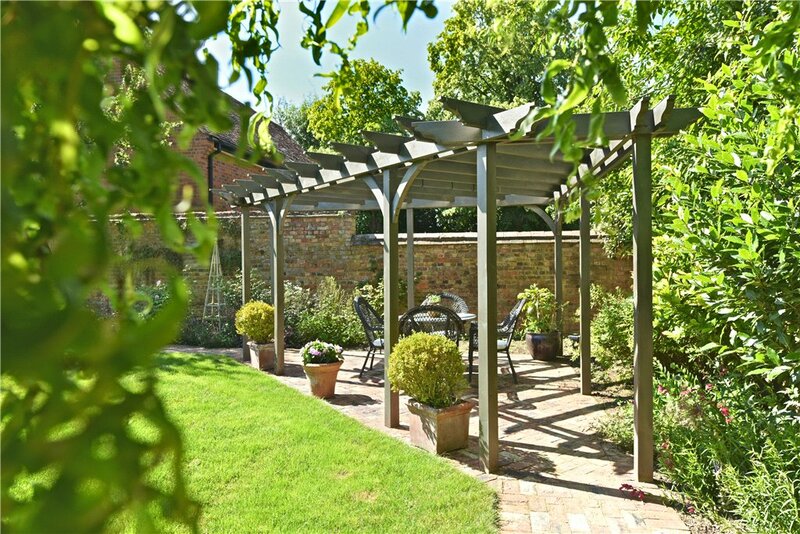 The garden is enclosed by tall brick walling with gated access to the driveway and garage. There is exterior lighting and a space with power for a shed. The side garden is paved with brick retaining walls and steps to the gravelled driveway which serves a total of three properties and leads to the double garage which has power, light and water. The block paved driveway provides parking for two cars and visitor space. 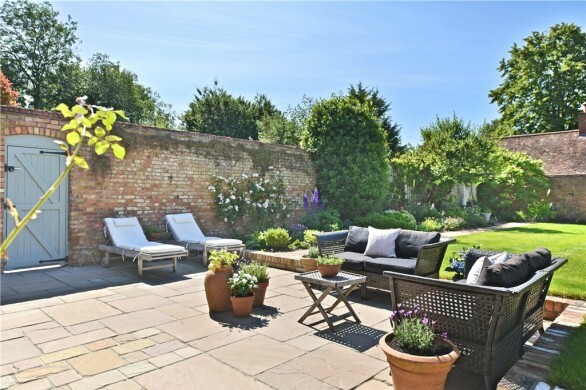 To the front of the property is a communal gated courtyard area owned by four properties including The Walled Garden. Approximately &#163;650.00 is paid every six months to the resident&#039;s association maintenance fund for gate maintenance and landscape maintenance. 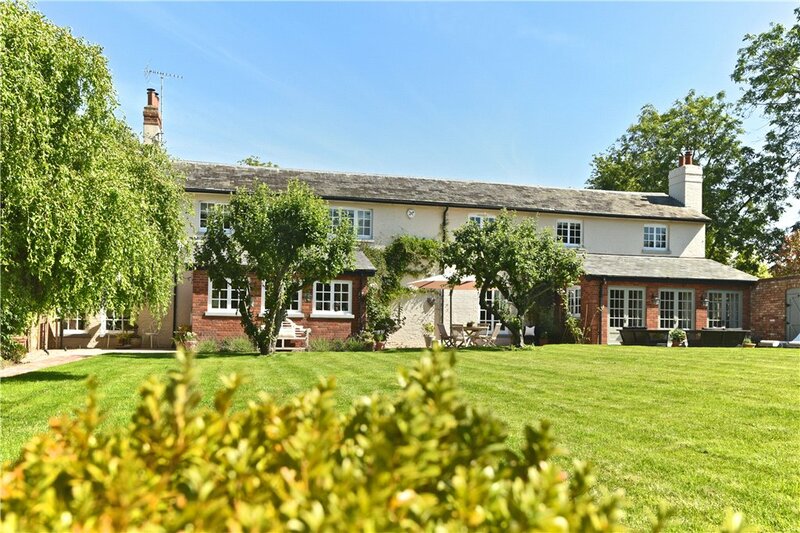 Select a date and time If you would like a viewing sooner, or to talk to a member of our team before requesting a viewing, please call us on 01908 307300.